Have you ever set up a Campbell Scientific data logger as a Modbus slave and discovered that your data was not arriving at your SCADA system as you expected? You may have quickly realized two things: troubleshooting the communication problem is not an easy task, and there are many different approaches you can take. In this article, I’ll quickly share with you one method that I have found to be both helpful and a time-saver. Campbell Scientific data loggers provide measurement data to SCADA (supervisory control and data acquisition) systems throughout the world. This is often accomplished by configuring the data logger as a Modbus TCP/IP slave, which we discussed in the “How to Access Live Measurement Data Using Modbus” blog article. Normally, the process of setting up the communication between your data logger and SCADA system is smooth, but there are occasions when technicians in the field discover that the data is not arriving at the SCADA system as expected. At times like this, you may wonder: Where is the problem with the communication? 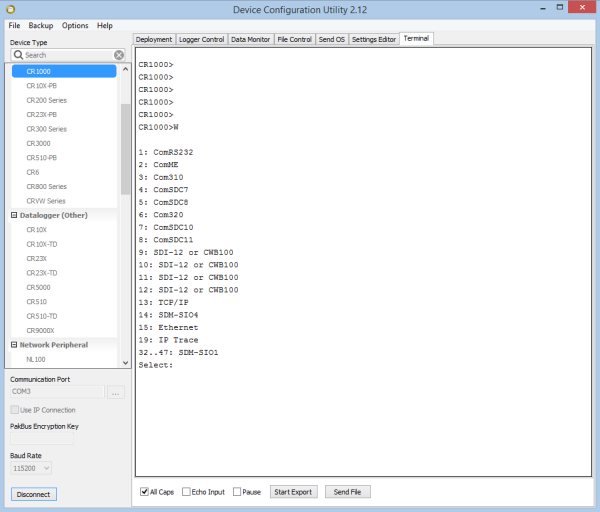 Is the problem at the SCADA system (Modbus master), the data logger (Modbus slave), or somewhere in-between? In our last Modbus blog article, we used an example with a data logger that was set up to make analog measurements and provide the data to the SCADA system through the Modbus TCP/IP protocol. We will use that same example here. Your SCADA system is set up to poll your data logger every second for the contents of its Modbus registers. Your data logger, in turn, makes analog measurements and then stores them in its Modbus Holding and Input registers every second. But what if your SCADA system does not successfully receive data from your data logger? What can you do now? 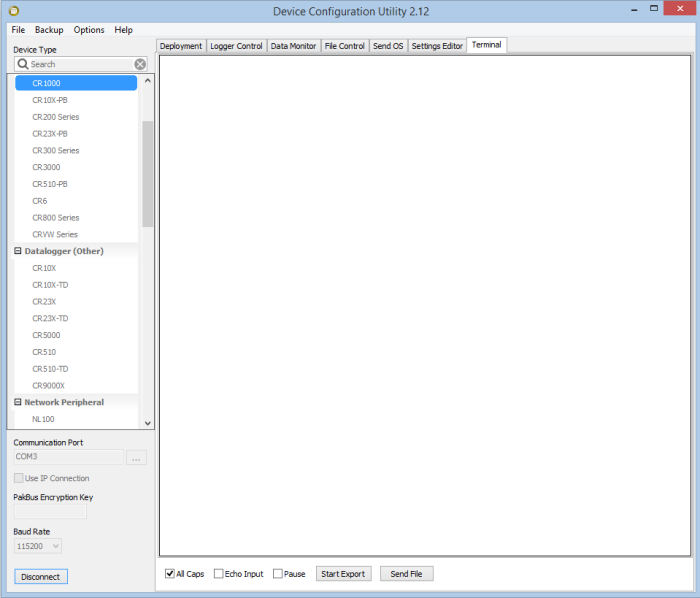 You can use Campbell Scientific’s Device Configuration Utility (DevConfig) to monitor the incoming traffic to your data logger. This helps determine if the polls from your SCADA system are arriving at your data logger, and if your data logger is responding. Open the Device Configuration Utility, and connect to your data logger. Select the Terminal tab on the far right. 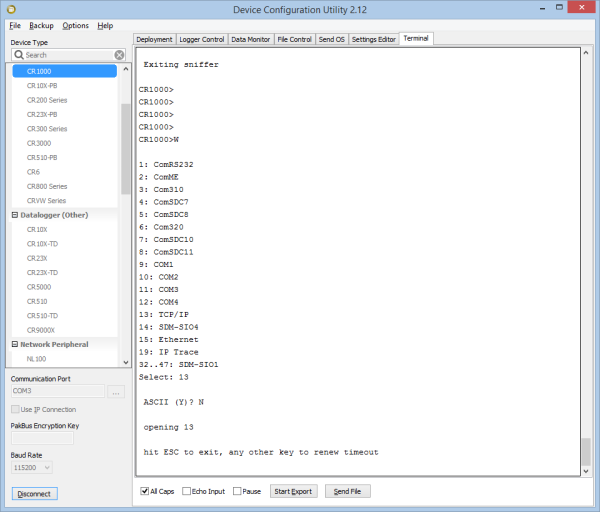 Click the DevConfig screen for a larger image. Press the Enter key on your keyboard until you see a prompt on your screen. Type W, and press the Enter key. To select TCP/IP, type 13 and press the Enter key. On your screen, you will be asked ASCII (Y)? Type N, and press the Enter key. The SCADA system is not polling the data logger. The SCADA system is polling a different IP address. The data logger has been assigned an incorrect IP address. A cable is not plugged in. Modbus traffic is being blocked by the network. Your data logger may be set up and programmed completely fine, but if it is not receiving the polls from the SCADA master, the data will not arrive where it is expected. 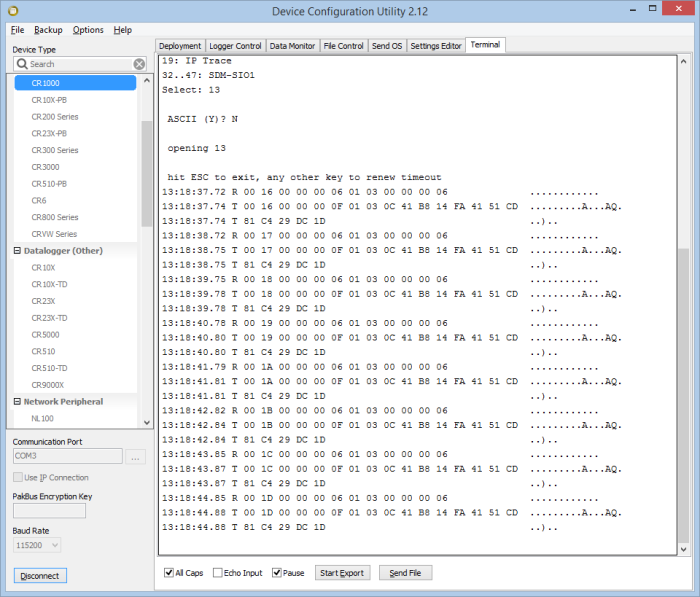 At this point, focus your troubleshooting efforts on the SCADA network, master configuration, etc. (areas outside of the data logger). 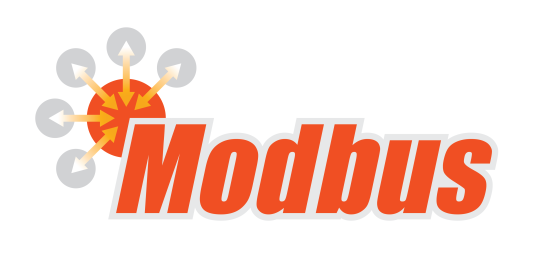 Special Note: In instances like this, you may see traffic over TCP/IP that is not Modbus traffic, such as PakBus traffic from a LoggerNet Server if there is a LoggerNet-to-data-logger connection on the network. The easiest way to recognize the Modbus TCP traffic and distinguish it from other protocols is that the transmission from the master always starts with an identifier in the first two bytes. In our example, the first poll that was recognized in the trace started with 00 16. The data logger, in turn, responded with this same unique identifier (00 16). The next time the master polled, it used an identifier of 00 17, and the data logger responded with 00 17. Special Note: There is a difference between Modbus TCP traffic and Modbus RTU traffic. The easiest way to recognize Modbus RTU traffic is to look for a transmission from the master that starts with the Modbus slave address and function code. The slave response will also start with its address and function code. The data logger is not programmed as a Modbus slave. The data logger has been given a Modbus slave ID that does not match what the master is polling. At this point, you’ll need to dig into your data logger setup for further troubleshooting. 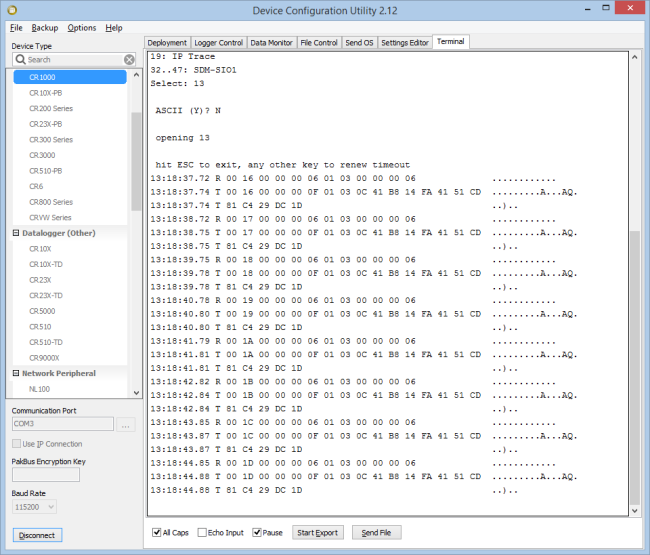 Using DevConfig to watch the TCP/IP traffic on your data logger is a great way you can quickly check to see if things are working as expected. This method often saves a lot of time because you can more quickly identify the communication problem. If you have any questions about this troubleshooting method, please post them below. Dear Paul, basically I do not understand, the reasons because with a commercial RS232 868Mhz radio-modem on port COM4 of a CR1000 OS31, the connection does not work with MODBUS protocol. 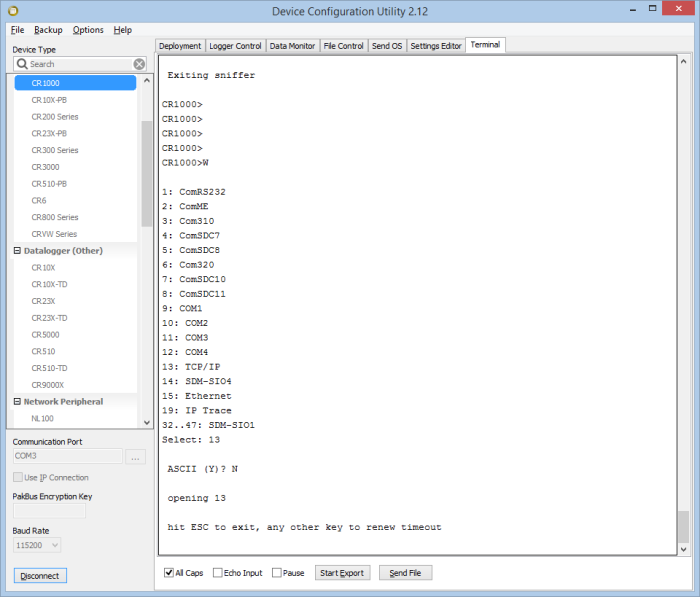 3) on RS232 port and COM4 with your RF416 radio (trasparent mode) all works fine (modbus and pakbus). Before spending time with sniffer on serial port and investigate with oscilloscope, these situations can suggest to you some idea? Unfortunately for local issues (distance, vegetation and other) can not use the your radio RF416. These are the lines that use in program. I can say that, when it does not work (commercial radio-COM4-MODBUS), the data arrives at the remote radio, in fact I can see the green LED RX that lights up, but the CR1000 does not respond and the red LED TX remains off. but I see that the CR1000 always immediate answer, of course, the working situation 1 (Commercial radio, RS232 MODBUS). I hope that this series of tests can give you some suggestions, of course I am available in case of questions. Sorry Paul, this was a premise that I forgot to put in my previous post. Dear Paul, perhaps you are the person that can help me a real headache. I've already opened a discussion on this subject in the forum and I also wrote to Franco Casule UK. Let's see who is able to help me before :-), unfortunately I have some urgency. What I'm writing is a synthesis of the two messages that I already wrote in the forum and Franco. Sorry for the delay in responding. It looks like JDavis has answered your question in the forum already concerning the potential issue with timing delays coming from the radio. Good luck going forward and thanks for reading.